The time has come. The concluding installment of the Zatanna series is in the spotlight for this, the 60th edition of The Silver Age Sage when we join her once again in her ongoing search for Zatara, her father. It's been 5 months since the last mention of the Maid of Magic and we now find her on the cover of the February 1967 issue, #51, of Justice League of America (cover art by Mike Sekowsky and Joe Giella) in the tale entitled "Z—as in Zatanna—and Zero Hour!" 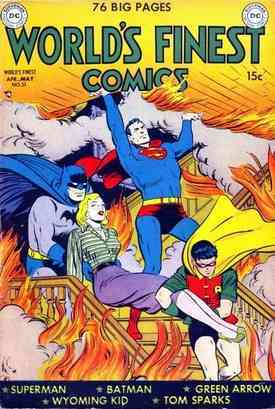 Our author is, to no one's surprise, Gardner Fox and Mike Sekowsky and Sid Greene provide the interior art. An added bonus to this story is the guest appearance of Ralph Dibney, the Elongated Man. The rest of the Justice League roll call includes a few faces who have seen Zatanna before: The Atom, Batman, Green Lantern and Hawkman. 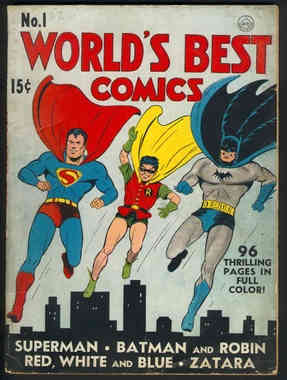 Regular readers of this feature will recall that I consider 1967 to be one of the peak years of the Silver Age. Let's see if this issue makes the grade as well. Magic has, of course, been the underlying foundation of this entire series of stories, so it seems only appropriate that this tale begins with our heroes suddenly materializing at the JLA headquarters, a bit baffled at being there. 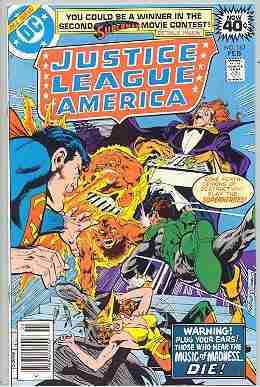 Of course none is as surprised as the Elongated Man as he isn't even on the roster--he waits six years for that privilege as seen in Justice League of America #105, 05/73. Their confusion is soon put to rest as Zatanna appears in a puff of smoke with congratulations, smiling hugs and thanks all around for the help they've given in finding Zatara at last. Confusion sets in yet again as the heroes recount their attempts at assistance, but that they'd all failed. Batman adds that he hasn't even met Zatanna before this time. Patiently, but eagerly, the magician tells her story. While browsing an antique shop in Vienna, she came across the sword of Paracelsus, a famous physician of the Middle Ages who dabbled in black magic. To her surprise and delight, Zatanna senses her father's aura on this ancient weapon and quickly does her trademark backward speaking incantation to learn of her father's encounter with the sword. A female visage appears in the base of the sword's grip and announces that Zatara used the weapon when he fought his last and greatest foe, just prior to being banished from the Earth. The being then identifies herself as Allura, an elemental who lives in the sword, which serves as a host body for her. Allura suggests that if Zatanna were to release her and serve as the host in place of the sword, she could lead her to Zatara. Taking her instruction from Allura, Zatanna then retrieved the tools she needed to perform the transfer, which included the book of I Ching and the Ting Tripod, which we saw in the last story with the Elongated Man. Using the items for the spell, Zatanna successfully becomes the new host for Allura and finds herself being transported to the land of Kharma, described as the last refuge of Zatara. Things get interesting in a big hurry as the local welcome wagon shows up in the form of the evil beast men of Belphagor. Zatanna quickly casts spells that cause the elements to stop the coming peril while unbeknownst to her another casts spells against her, aiding the beast men. As they continue to advance, she changes tactics and uses her magic to summon the magical counterparts of the members of the Justice League who aided her in the past. The Atom, Green Lantern and Hawkman in a sort of astral form immediately begin to engage the creatures, even though GL's power ring is being temperamental. After a fierce back and forth battle, our heroes succeed in putting down their foes and a thrilled Zatanna leads them to seek out her father. The final panel in part I, however, reveals a strange twist. For the first time in the series we are face to face with Zatara and he is conjuring to beat the band while curiously stating the following: "I must defeat Zatanna in her attempt to reach me! If I fail—but I must not permit myself to think of—that disaster!" 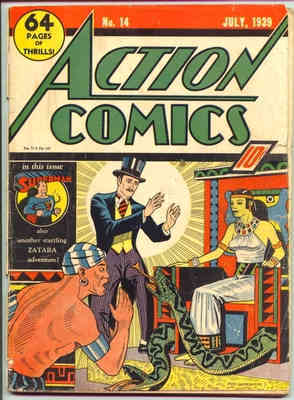 Part II opens with the spiffily dressed Zatara calling in an old nemesis by the name of Amen-Hotep, an ancient Egyptian necromancer. Zatara commands the evil wizard to stop his daughter through the power of his ancient parchments. Soon our hardy little band encounters a skyscraper sized Amen-Hotep, who wastes no time in releasing enchanted creatures from the scrolls to battle the Justice League members. Again a mighty battle ensues, the only glitch being Green Lantern's ring abruptly being ineffective against a winged "Ba," which is like a bird of prey with a man's head. Deciding sometimes the direct approach is best, GL resorts to a good old-fashioned right cross. Despite their success, however, the heroes are in danger of being overrun by sheer numbers. Just to make things even more fun, some of the parchments begin to envelop Zatanna, wrapping her up in a cocoon of paper. Allura warns that she is growing weak. Zatanna then remembers that she'd been in contact in the past with both the Elongated Man and Batman, so she summons their magical counterparts as well. At this point, Batman interrupts Zatanna's story to contend with her. He still insists they've never been in contact before. Zatanna then reminds the Gotham Goliath that she had been the witch he'd encountered who had served The Outsider. She had come to Gotham to find the Outsider for further clues, but fell under his influence instead. She was able, however, to cause Robin to grab her broomstick and defeat her, freeing Zatanna from the spell. Back to the battle. Batman arrives just in time to rip the stifling papyrus from Zatanna while the Elongated Man uses a s-t-r-e-t-c-h-e-d arm with a fist at the end to clock Amen-Hotep. The fighting begins anew when Batman abruptly ceases and insists that his fellow heroes follow suit. Thinking their fellow member has snapped under the strain, they try to subdue him, but the Masked Manhunter continues with his thread, explaining that they must allow the Egyptian magic-men to capture Zatanna. 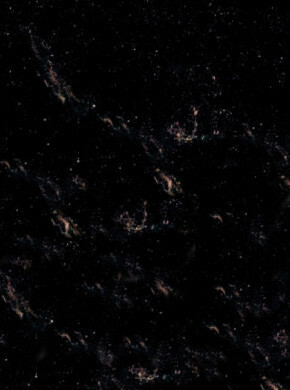 Continuing to elaborate, the World's Greatest Detective states that the bells on the horns of the bull-man, the parchments or "book" and the "sun" of this magical world, which is a giant candle, add up to something significant: Bell, book and candle, which is the rite by which demons are exorcised from a person's body. 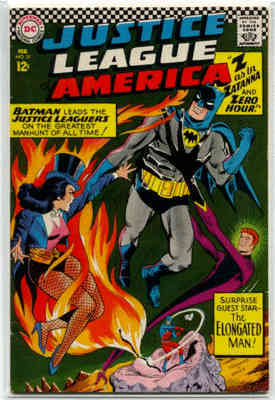 From this, Batman concludes that Zatanna is possessed by a demon. They then allow Zatanna to be taken and Part II closes. Part III begins with a bizarre scene as Zatanna is held over the flame of the huge magic candle, which causes her no discomfort, but drives Allura from her body. 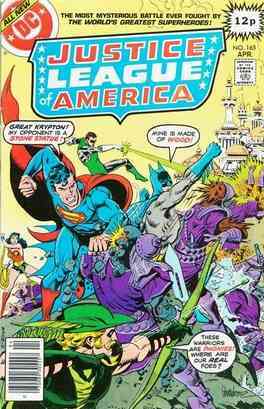 The members of the Justice League along with the Elongated Man look on as another Allura arrives to take on her nearly identical and evil twin. 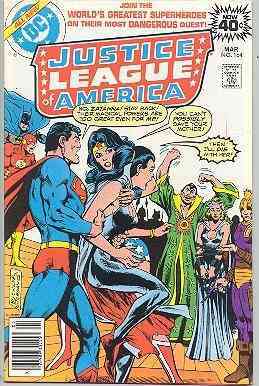 The League members soon realize that the forces of Kharma were fighting Allura, not Zatanna. 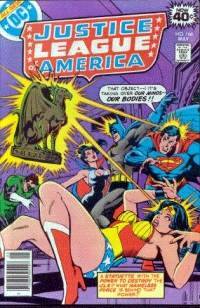 The mystical catfight begins and Hawkman pulls Zatanna away from the spectacle as the sisters engage. Soon the good Allura triumphs and demands that her defeated sister release Zatara from the curse she'd placed him under so long a! go. After the incantation is uttered a portal opens and a reunion between father and daughter takes place after twenty years. Zatara asks his daughter for forgiveness for sending the creatures at her, but knew that it was the only way he could hope to defeat Allura, who used treachery to gain possession of Zatanna. He further recounts how he defeated Allura, but as he imprisoned her in the sword of Paracelsus, she placed a hasty curse upon him, dooming both him and Zatanna to certain death if they encountered one another. Therefore, Zatara left the Earth and sought a cure for the curse, finally locating the good Allura, only to find that she could not leave the world of Kharma. Zatara then learned through mystic communications that the evil Allura had led Zatanna to Kharma to finally destroy both father and daughter. Then of course the events continued until the final removal of the curse. The astral Green Lantern had one question on his mind and that was the flaky behavior of his ring. Zatara explained that all light is of an energy frequency and therefore the ringing of the bells on the horns of the man-beast were of such a frequency that they replicated certain light radiation, which just happened to be yellow, the weakness in the ring of Green Lantern. Zatanna then concludes her tale to the "real" Justice League members who are delighted that things have ended happily for the Magic Maid. Hawkman muses that he'd enjoy meeting Zatara and no sooner does he utter the words then Zatanna conjures her father to the Justice League headquarters to add his own personal thanks for their help. Asked about future plans, Zatara merely looks adoringly into his daughter's face and says that they're just going to spend some time getting acquainted. The story ends on that heart-warming note and so does this excellent series. 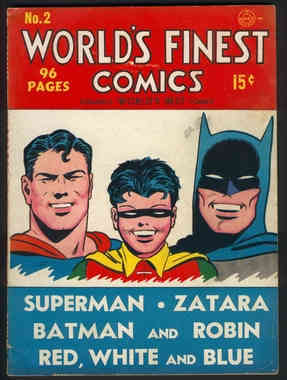 I wanted to make certain and mention here that Zatara is a classic member of the DC Universe. As a matter of fact, I've read his debut tale. 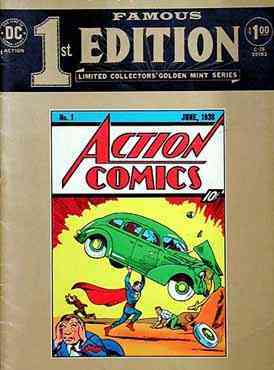 You can, too, if you happen to own a copy of Action Comics #1 or a reprint, Famous First Edition C-26 from 1974 in this instance, of same. You may recall that issue. 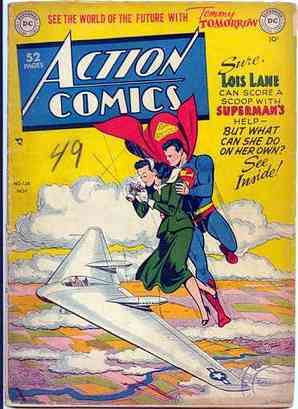 It also introduced Superman to the world. In the pages of that first tale, the master magician used his trademark backward-speak to weave his spells as he pursued his arch-enemy, The Tigress with the help of his turbaned assistant, Tong. 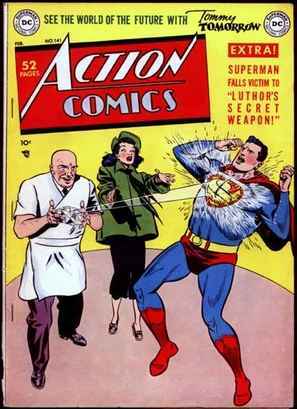 Credit for the story went to Fred Guardineer with help from an uncredited Gardner Fox. 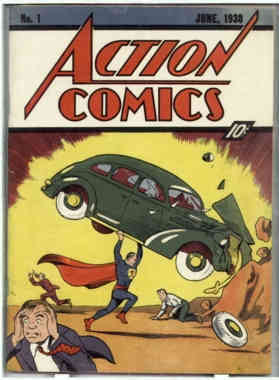 Zatara appeared in 136 consecutive issues of Action Comics between 1938 and 1949. He also appeared in issues 138 & 141. 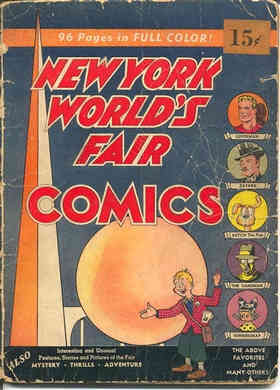 He can also be found in the 1939 edition of New York World's Fair Comics as well as the first (and only) issue of World's Best Comics, Spring 1941, and several issues of World's Finest Comics published between 1941 and 1951. 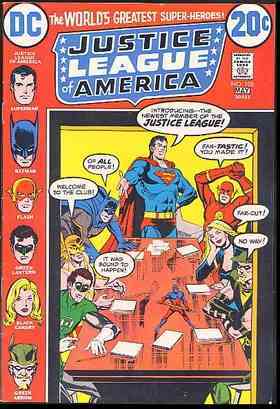 He encountered the JLA again in issues 163, 164 and 165 (1979). [FYI: #165 is the last Julius Schwartz edited issue. 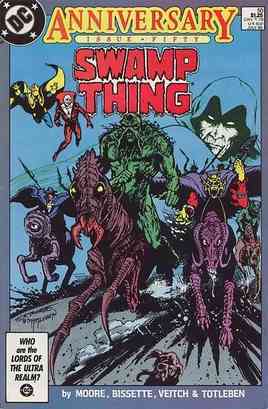 Artist Ross Andru takes the editorial helm with #166] Swamp Thing #50, 07/86 tells the tale of his demise! Fear not gentle reader, death is of little consequence to a true master of the mystic arts such as Zatara! He has gone on to make a handfull of ghostly appearances in various DC titles. This final installation in the Zatanna series gets a 9. It wasn't quite a classic, even though it was a very good tale. I just had a hard time keeping up when all the complex explanations for Batman's bizarre behavior and the realm-hopping of Zatara while still trying to keep straight when you were dealing with the real JLA and the astral counterparts. It confused me to the point I had to carefully re-read certain parts and that took a little of the luster off the story for me. Still, I thought the series, as a whole was an inspired bit of story telling. Even though there was the occasional misstep and as a rule I don't care for the never-ending story, it was well worth the time and effort and as a collective it rates a 10 on my scale. I hope you enjoyed this series as well and if you have questions or comments I hope you'll let me know at silveragesage@thesilverlantern.com. 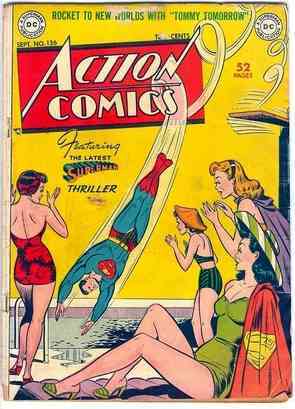 My standing invitation is still in place to join me again in approximately two weeks for another look back at these classic stories from DC comics.